Definition at line 129 of file stat.h. Definition at line 269 of file stat.h. Definition at line 140 of file stat.h. Definition at line 309 of file stat.h. Definition at line 135 of file stat.h. Definition at line 134 of file stat.h. Definition at line 136 of file stat.h. Definition at line 133 of file stat.h. Definition at line 137 of file stat.h. Definition at line 138 of file stat.h. Definition at line 329 of file stat.h. Definition at line 321 of file stat.h. Definition at line 139 of file stat.h. Definition at line 323 of file stat.h. Definition at line 322 of file stat.h. Definition at line 24 of file stat.h. Definition at line 217 of file stat.h. Definition at line 317 of file stat.h. Definition at line 319 of file stat.h. Definition at line 313 of file stat.h. Definition at line 312 of file stat.h. Definition at line 318 of file stat.h. Definition at line 311 of file stat.h. Definition at line 314 of file stat.h. Definition at line 315 of file stat.h. Definition at line 328 of file stat.h. Definition at line 325 of file stat.h. Definition at line 334 of file stat.h. Definition at line 333 of file stat.h. Definition at line 331 of file stat.h. Definition at line 332 of file stat.h. Definition at line 335 of file stat.h. Definition at line 316 of file stat.h. Definition at line 327 of file stat.h. Definition at line 326 of file stat.h. 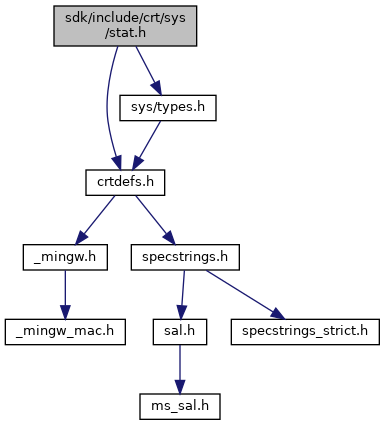 Referenced by _fstat32(), CRTDLL__fstat(), and fstat(). Definition at line 270 of file stat.h. Definition at line 287 of file stat.h. Referenced by CRTDLL__stat(), MkDirs(), and stat(). Definition at line 341 of file stat.h. Referenced by disk_query_directory(), disk_query_information(), disk_set_information(), import_certs_from_path(), File::length(), load_licence(), loadFile(), main(), NotifyInfo(), printercache_load_blob(), ruserpass(), sendrequest(), and test_stat(). Definition at line 345 of file stat.h. Referenced by _cwait(), _des_crypt_call(), _svcauth_unix(), add_font_proc(), add_storages_to_table(), adns__query_fail(), adns__search_next(), adns_submit(), alpha_blend_pixels_hrgn(), auth_errmsg(), authunix_refresh(), brush_fill_pixels(), check_enum_cache(), check_family(), check_iml_data(), check_metafile(), check_storage_contents(), checkarch(), CheckForNewV3User(), chmc_appendfile(), clnt_sperrno(), clone_element(), CoGetInstanceFromIStorage(), compat_isdir(), compat_nextdir(), compat_nextfile(), create_EnumSTATPROPSETSTG(), CCabinet::CreateSimpleCabinet(), CustomMarshal_MarshalInterface(), disk_create(), disk_query_directory(), draw_driver_string(), draw_string_callback(), encode_image_wic(), enum_stream_names(), expect_rawformat(), f_getfree(), f_mkfs(), find_volume(), FindFonts(), fnIMultiLanguage3_ConvertStringInIStream(), gdip_format_string(), gdip_get_font_metrics(), gdip_transform_points(), GdipAddPathClosedCurve2(), GdipAddPathClosedCurve2I(), GdipAddPathCurve2(), GdipAddPathCurve2I(), GdipAddPathLine2I(), GdipBeginContainer(), GdipBitmapLockBits(), GdipBitmapUnlockBits(), GdipCloneBitmapArea(), GdipCloneBrush(), GdipCloneFont(), GdipCloneImageAttributes(), GdipClonePen(), GdipCombineRegionPath(), GdipCombineRegionRect(), GdipCombineRegionRegion(), GdipCreateAdjustableArrowCap(), GdipCreateBitmapFromFile(), GdipCreateBitmapFromHICON(), GdipCreateBitmapFromResource(), GdipCreateBitmapFromScan0(), GdipCreateBitmapFromStream(), GdipCreateCachedBitmap(), GdipCreateCustomLineCap(), GdipCreateFont(), GdipCreateFontFamilyFromName(), GdipCreateFontFromLogfontW(), GdipCreateHBITMAPFromBitmap(), GdipCreateHICONFromBitmap(), GdipCreateLineBrush(), GdipCreateLineBrushFromRectWithAngle(), GdipCreateMetafileFromEmf(), GdipCreateMetafileFromStream(), GdipCreatePathGradient(), GdipCreatePathGradientFromPath(), GdipCreatePathGradientI(), GdipCreateRegionHrgn(), GdipCreateRegionPath(), GdipCreateRegionRect(), GdipCreateTexture(), GdipCreateTexture2(), GdipCreateTexture2I(), GdipDeleteGraphics(), GdipDrawClosedCurve2I(), GdipDrawImagePointsRect(), GdipEnumerateMetafileSrcRectDestPoints(), GdipFillClosedCurve2I(), GdipFillEllipse(), GdipFillPath(), GdipFillPie(), GdipFillPolygon(), GdipFillPolygonI(), GdipFillRegion(), GdipFlattenPath(), GdipGetDC(), GdipGetFontCollectionFamilyList(), GdipGetFontHeight(), GdipGetFontHeightGivenDPI(), GdipGetGenericFontFamilyMonospace(), GdipGetGenericFontFamilySansSerif(), GdipGetGenericFontFamilySerif(), GdipGetImageGraphicsContext(), GdipGetImageThumbnail(), GdipGetPathGradientRect(), GdipGetPathGradientRectI(), GdipGetPropertyItem(), GdipGetRegionScans(), GdipGetRegionScansCount(), GdipGetRegionScansI(), GdipGetVisibleClipBounds(), GdipGetVisibleClipBoundsI(), GdipGraphicsClear(), GdipImageRotateFlip(), GdipImageSelectActiveFrame(), GdipIsEqualRegion(), GdipIsOutlineVisiblePathPoint(), GdipIsVisibleClipEmpty(), GdipIsVisiblePoint(), GdipIsVisibleRect(), GdipIsVisibleRegionPoint(), GdipIsVisibleRegionRect(), GdipLoadImageFromFile(), GdipLoadImageFromStream(), GdipMeasureCharacterRanges(), GdipPlayMetafileRecord(), GdipRecordMetafile(), GdipRecordMetafileStream(), GdipReleaseDC(), GdipResetWorldTransform(), GdipRotateWorldTransform(), GdipSaveImageToFile(), GdipSaveImageToStream(), GdipScaleWorldTransform(), GdipSetCompositingMode(), GdipSetCompositingQuality(), GdipSetEmpty(), GdipSetInfinite(), GdipSetInterpolationMode(), GdipSetPageScale(), GdipSetPageUnit(), GdipSetPixelOffsetMode(), GdipSetSmoothingMode(), GdipSetTextRenderingHint(), GdipSetWorldTransform(), GdipTranslateWorldTransform(), generate_random(), get_clip_hrgn(), get_graphics_bounds(), get_graphics_device_bounds(), get_graphics_transform(), get_path_hrgn(), get_region_hrgn(), get_region_scans_data(), get_visible_clip_region(), CCabinet::GetAttributesOnFile(), CCabinet::GetFileTimes(), getit(), InitOurDirectory(), IPropertyStorage_fnStat(), TConfig::keyfile_init(), load_dib(), load_emf(), load_mf_pict(), load_streams(), LoadUnknownMetadata(), LresultFromObject(), main(), make_directory_records(), measure_ranges_callback(), METAFILE_AddBrushObject(), METAFILE_AddImageAttributesObject(), METAFILE_AddImageObject(), METAFILE_AddPathObject(), METAFILE_AddPenObject(), METAFILE_AddRegionObject(), METAFILE_AddSimpleProperty(), METAFILE_BeginContainer(), METAFILE_BeginContainerNoParams(), METAFILE_CreateCompressedImageStream(), METAFILE_DrawImagePointsRect(), METAFILE_DrawPath(), METAFILE_EndContainer(), METAFILE_FillPath(), METAFILE_FillRectangles(), METAFILE_GetDC(), METAFILE_GetGraphicsContext(), METAFILE_GraphicsClear(), METAFILE_GraphicsDeleted(), METAFILE_MultiplyWorldTransform(), METAFILE_PlaybackGetDC(), METAFILE_PlaybackUpdateClip(), METAFILE_PlaybackUpdateWorldTransform(), METAFILE_ResetWorldTransform(), METAFILE_RestoreGraphics(), METAFILE_RotateWorldTransform(), METAFILE_SaveGraphics(), METAFILE_ScaleWorldTransform(), METAFILE_SetClipRect(), METAFILE_SetClipRegion(), METAFILE_SetPageTransform(), METAFILE_SetWorldTransform(), METAFILE_TranslateWorldTransform(), METAFILE_WriteEndOfFile(), METAFILE_WriteHeader(), MkSpoolDir(), mono_assembly_search_hook_fn(), MSI_DatabaseApplyTransformW(), msi_get_stream_size(), MSI_OpenDatabaseW(), msi_table_apply_transform(), MsiSIPIsMyTypeOfFile(), new_assign_statement(), new_call_statement(), new_case_clausule(), new_const_statement(), new_dim_statement(), new_elseif_decl(), new_foreach_statement(), new_forto_statement(), new_function_statement(), new_if_statement(), new_onerror_statement(), new_select_statement(), new_set_statement(), new_statement(), new_while_statement(), NotifyInfo(), OLECONVERT_GetOLE10ProgID(), OleDoAutoConvert(), open_weak_exclusive(), parseAndPrintFile(), play_metafile(), play_metafile_proc(), process_directory(), prop_enum_stat(), PropertyStorage_ReadFromStream(), query_simple(), read_stream_data(), scan_specified_files(), searchonefile(), SHPropStgReadMultiple(), SHPropStgWriteMultiple(), SOFTWARE_GdipDrawDriverString(), SOFTWARE_GdipDrawPath(), SOFTWARE_GdipDrawThinPath(), SOFTWARE_GdipFillPath(), SOFTWARE_GdipFillRegion(), source_add_statement(), stat_filter(), statusclb_OnDataAvailable(), StorageImpl_Construct(), stream_info(), stream_to_storage(), svc_getreq_common(), sync_metafile(), Test2(), Test3(), test_bitmapfromgraphics(), test_bufferrawformat(), test_captype(), test_characterrange(), test_clear(), test_clipping(), test_colorkey(), test_colormatrix(), test_constructor(), test_constructor3(), test_constructor_destructor(), test_containers(), test_converttoemfplus(), test_create_adjustable_cap(), test_createeffect(), test_createfont(), test_createfromwmf(), test_createfromwmf_noplaceable(), test_createhbitmap(), test_digitsubstitution(), test_dispose(), test_drawimage(), test_drawpath(), test_emfonly(), test_empty(), test_encoders(), test_fillpath(), test_fillrect(), test_flushed_getdata(), test_FlushFileBuffers(), test_fmtusertypestg(), test_font_metrics(), test_fontfamily(), test_fontfamily_properties(), test_frameunit(), test_FromGdiDib(), test_fromhicon(), test_gamma(), test_GdipCloneImage(), test_GdipCreateBitmapFromHBITMAP(), test_GdipGetImageFlags(), test_GdipImageGetFrameDimensionsCount(), test_gditransform(), test_gditransform_cb(), test_getadjustedpalette(), test_getdc(), test_getgenericdefault(), test_getgenerics(), test_getgenerictypographic(), test_GetImageDimension(), test_getsetpixel(), test_getsubpathcount(), test_getthumbnail(), test_hascurve(), test_heightgivendpi(), test_hglobal_storage_creation(), test_hglobal_storage_stat(), test_histogram(), test_imageabort(), test_InProcess(), test_inset(), test_installedfonts(), test_isidentity(), test_isvalid(), test_linejoin(), test_LoadingImages(), test_loadwmf(), test_LockBits(), test_LockBits_UserBuf(), test_logfont(), test_long_name(), test_multiframegif(), test_nextmarker(), test_nextmarkerpath(), test_nextpathtype(), test_nextsubpath(), test_nextsubpathpath(), test_nullframerect(), test_OutOfProcess(), test_pagetransform(), test_palette(), test_persiststreaminit(), test_properties(), test_remaptable(), test_resolution(), test_rotateflip(), test_save_restore(), test_SavingImages(), test_scale(), test_Scan0(), test_simple(), test_stat(), test_storage_refcount(), test_streamenum(), test_stringformatflags(), test_tabstops(), test_testcontrol(), test_toplevel_stat(), test_waittxempty(), test_worldtransform(), TimerCallback1(), transform_region_element(), TruncBatchLog(), VfdStartDriver(), VfdStopDriver(), write_if_change(), write_stream(), WriteFmtUserTypeStg(), xdr_reference(), xdr_sizeof(), and xsltCheckFilename(). Definition at line 349 of file stat.h.